1. Connecting in-person with online friends! So the truth is, most of the authors I know (myself included) kind of spend a lot of time on Twitter. It’s not just because we’re wasting time (okay, sometimes it is). Twitter is where so many good conversations are. When your author friends are far-flung, it’s the place to keep in touch. It’s also a great space to connect with educators. In truth, I’d be lying if I said a day went by when I didn’t check Twitter. It was so wonderful to meet in-person a ton of people I’d previously only chatted with online — from many of the fantastic educators that are parts of #bookjourney, #bookvoyage, #bookexpedition and beyond, to author friends like Mike Grosso and Elaine Vickers and Abby Cooper and Carter Higgins. 2. Leaving inspired. One of my key takeaways from Nerd Camp this year was that sometimes the person who needs to take the leap of faith is you. 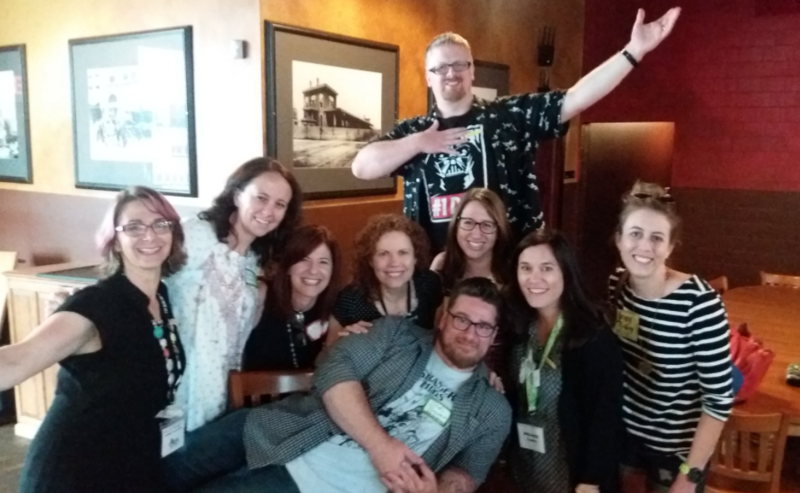 I have some ideas about how to connect Cincy-area children’s book people (educators, authors, booksellers) and this fall I’m going to get to work. 3. Fantastic break-out sessions on day one. There was so much to take away from Shannon Hale and Dean Hale’s excellent session, “Stories for All,” about so-called “boy” books and “girl” books. I’ve been trying to unpack some of my own experiences, after one year of being a female author attending conferences and book festivals, and this gave me so much to chew on. (Also, there are still so many of Shannon Hale’s books that I have to read!) In Donalyn Miller and Teri Lesesne’s session, I learned a new word: bibliothecary and, oh yeah, continued to grow my TBR. 4. Learning from fellow authors. On day two, I loved hearing about Caroline Starr Rose’s writing process, especially because she writes historical fiction. I’ve been really enjoying reading historical fiction lately but have always felt so intimidated about how to approach it as a writer. Where do you even start? She talked about how she takes 4-6 months to read exclusively about a setting/time period, allowing herself to ask questions and see where that leads her in terms of what the story could be. I always assumed you had to have an idea and then research! Mind. Blown. 5. Learning from teachers. In day two, I sat in on two great teacher-led sessions. The first was on how to motivate readers without rewards. (I feel so guilty for my years as a public librarian using rewards — books, but still — to entice kids to participate in our summer reading program.) The second was on Little Free Libraries, a topic close to my heart since we finally put up a little free library in our front yard just a month ago. I’m excited to put a guestbook in our little free library and create a FB page for it. 6. The kids at Nerd Camp Junior. Just like last year, these kids blew my mind with their creativity. Our activity this year was Mystery Box. 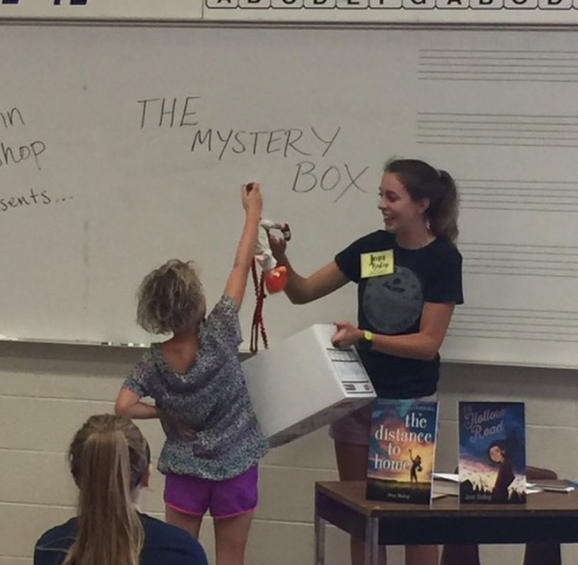 The sixth graders in my sessions reached into the Mystery Box (dun, dun, dun) to discover which random item would inspire them with new story ideas. They generated SUCH exciting ideas. It felt like I was sitting in at a Hollywood pitch session. And because I had fifth graders last year, I got to catch up with several of the same kids, now as sixth graders! It was so cool to see their love of stories grow. 7. You will cry. Every time, the Opening Talks at Nerd Camp get me. These seven minute talks, from a variety of educators and authors, always get me going, and this time was no exception. Stacey Reidmiller’s (@literacybigkids online) gave me all the feels and it was only downhill from there. I wish every teacher (and parent) in the country could see these speeches, particularly Tracey Baptiste and Chad Everett’s. 10. Nerd Camp isn’t the end. It’s the beginning. < Previous 14 Hollow Road — now out in the world! Love this post! Loved connecting with you. I can’t wait to get my class connected this year via Skype…. or in person since we are both in Cincy! Would love to Skype and/or visit with your class, Alison! Thanks for the overview. 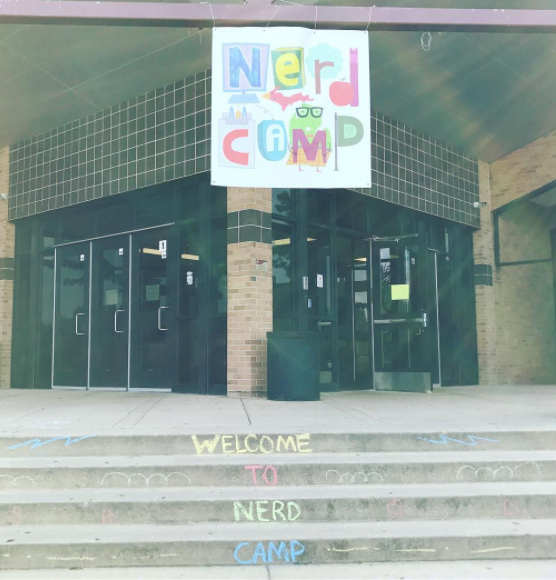 Nerdcamp sounds absolutely delightful. Will see if I can swing attending from California. You mentioned you sat on a teacher session “how to motivate readers without rewards”. Would you able to share some of the takeaways from it? I’m feeling a little guilty that I instituted a summer reward program for my 9year old to get her to read books that have more words. She has an immense love for graphic novels which I support but as a result she immediately shuns the more traditional forms. She routinely tells me she is only reading these books because of the grand prize. I also recommend reading Donalyn Miller’s books (and following her on Twitter! ), which speak to the importance of letting kids choose their own reading materials. Literacy grows from so many sources, including graphic novels. And kids are so empowered by selecting their own reading. I’ve learned so much about this, mostly from Twitter and the conversations at Nerd Camp. Looking back now, I can see that while as a kid I participated in reading contests at the library and definitely enjoyed rewards, I was also intrinsically rewarded by reading. I read for myself. I am one of the teachers who led the session on reading rituals. We will be posting a resource link to the the Google notes either tonight or tomorrow (it might already be on). It will be a link to Padlet with all of the resources. I work hard to build a community of readers or love/excitement of books in my classroom. If you want to chat more feel free to email me: junieb20@neo.rr.com. I also post a ton about my classroom on Instagram @mrsalbrecht20. Jenn: I just emailed you b/c your book The Distance to Home was on our Mock Newbery list for last year. I’m so excited our session was helpful. Thank you so much. This is great! I really appreciate it. Hi Darshana–we just posted the slides from the Motivating Readers session at https://padlet.com/ajohnsont2t/vqljtbwrhazs The explanations for the slides are at the Google doc Jenn already posted. The recorder for that session did an excellent job of taking detailed notes!